Author(s): Hashemi, A. & Cruickshank, H.
Abstract: This paper evaluates the embodied energy of fired/burned bricks as one of the major construction materials in East African countries. Production processes of bricks by artisans, and small- and medium-scale manufacturers are explained. Embodied energy of brick walls is also calculated and the key factors in the energy efficiency of brick kilns are discussed in detail. 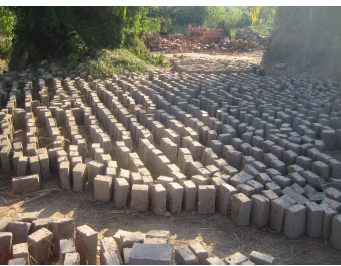 Low quality, high material waste and excessive energy waste during production and handling are highlighted as the major issues associate with traditional manufacturing processes of burned bricks in Uganda and Tanzania. The results reveal that small clamp kilns lose up to 3.5 times more energy through their cooling surfaces compared to large kilns. The results also indicate that clamp fired bricks are up to 60% more energy intensive than generic bricks and the embodied energy of artisan brick walls is 35% more than standard brick walls with comparable thicknesses. Improving kiln construction and production methods, educating artisan producers, replanting tress, providing alternative renewable energy sources, and design improvements to control fire intensity and air circulation in brick kilns are some of the recommendations to improve the energy efficiency and mitigate the environmental impacts of fired bricks in East African countries.